I love participating in exchanges or swaps and I have no clue how our sweet Stephanie from The Enchanted Rose pulls them off like she does! All I know is GOD BLESS HER because I have been in charge of a few of these on a much smaller scale in the past and I can assure you it's a great undertaking. Stephanie does it with grace and I am so thankful for her. 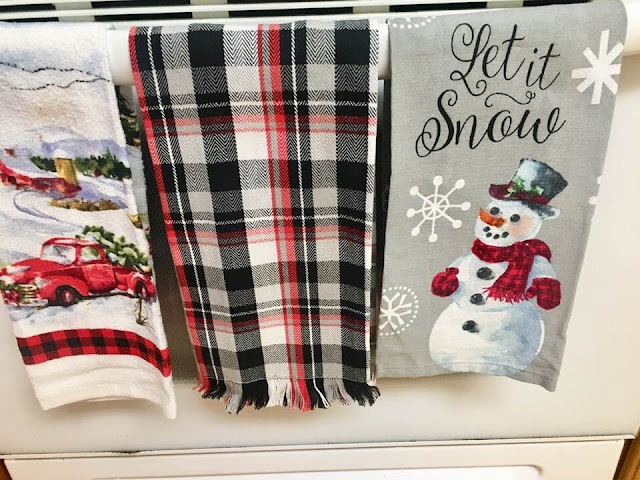 Not only did she peg me out with the ornament that fits my kitchen theme this season but also lovely dish towels that I could not have hand picked them any better! AMAZING at how the colors and style went right along with my theme this year for my kitchen. I absolutley love the snow flake. Aren't these dish towels the cutest? And they go so well with my Red truck dish towel. Yummy teas and oh the best pure cane sugar ever! And isn't this angel just precious. She looks so precious sitting next to baby Jesus. And wouldn't you know it but the first Tea Cup Exchange that Denise participated in I was the one chosen to gift to her. Hop over and visit Denise when you can. She is a lovely woman and the girl can do her some quilting! I was give Barbara's name. 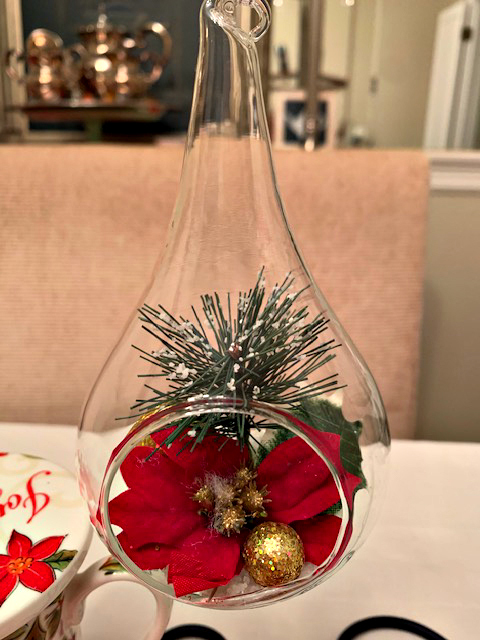 Barbara does not have a blog but I sure enjoyed choosing her ornament and a little extra for her. 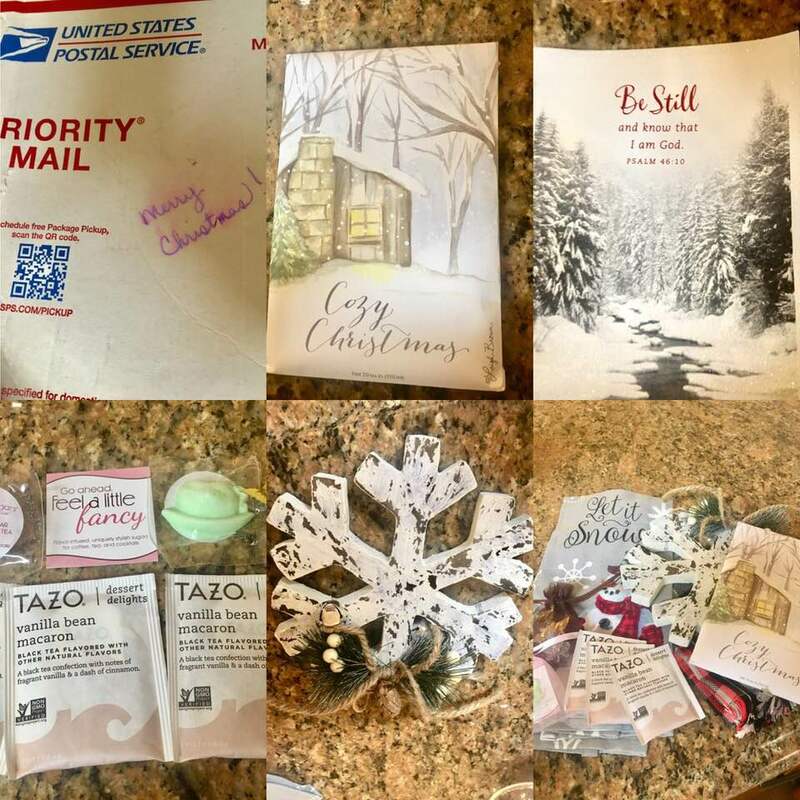 I failed to take pictures but sweet Barbara snapped a few to send to me to show you all the ornament and goodies I sent to her. I fell in love with this ornament. Barbara said it was perfect for her tree. Since the ornament had a poinsettia I was happy to find the poinsettia mug with lid to match. Added a little chocolate and Christmas edition of Daily Bread and prayed over sweet Barbara as I wrapped her gifts. This was so much fun. I always look forward to Stephanie's exchanges or swaps. A great big THANKYOU to Stephanie for organizing such a fun and wonderful Exchange/Swap. 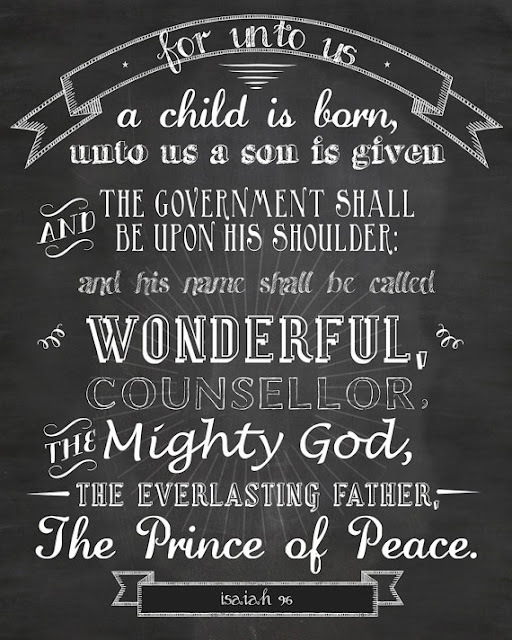 Here's hoping that you all have a great week and that in the midst of what can be a busy and hectic holiday season that we never loose sight of why we truly celebrate CHRISTmas. Hello, my sweet friend! It was truly a joy to see the delights Denise sent to you and oh, what beautiful treasures you sent to Barbara. I am so glad you joined the fun. May you have a most wonderful Christmas. Hugs! Yes, exchanges are so much fun but I decided not to participate in this one. Just didn't want another thing on my list. But, I've sure enjoyed seeing everyone's ornaments. Love the towels, just so cute in your kitchen. Happy last week before Cmas. I’ve enjoyed the exchange and making a new friend has been a plus . But it has indeed been a busy season . Cute! Cute! Cute! Love those tea towels with your red truck tea towel, perfect. The ornament you gifted is quite unique and looks lovely with all the poinsettia additions you added. Beautiful gifts both received and given. Thank you Debbie. It has been fun. Such adorable things you ladies exchanged. I wish I had time to blog but instead I will just snoop. Ha! I love the blown glass ornament. Thanks Connie. Barbara has no clue how close I came to keeping that blown glass ornament! LOL! What wonderful gifts you were gifted and gave, Cindy! 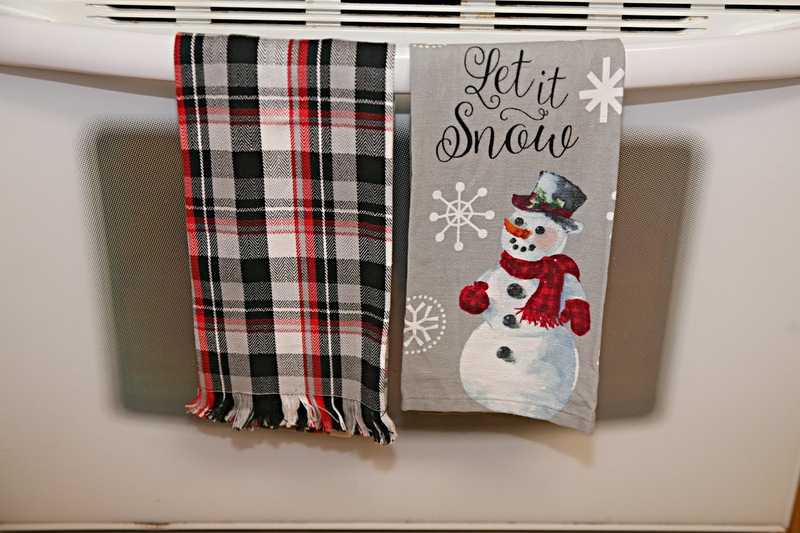 The tea towels are just perfect for your kitchen. I love how you prayed over Barbara as you prepared her gifts. Sweet Stephanie is a master at organizing her precious exchanges. I didn't participate this time, but maybe next year. 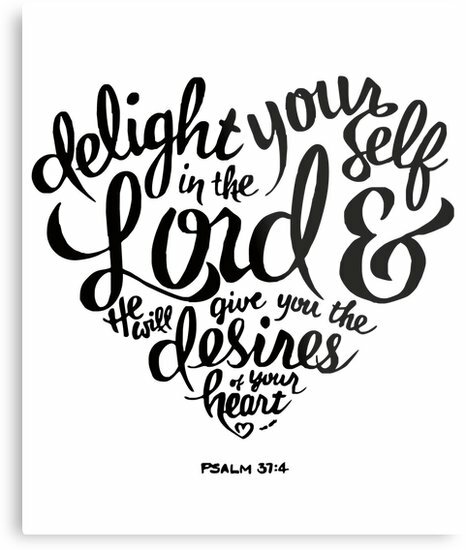 Merry Christmas blessings to you, sweet friend! Merry Christmas to you dear Kitty. Your friendship has surely been a blessing to me. That Denise is one special lady, isn't she? She is such a great encourager and I love seeing all of the different things that she quilts. Your gifts from her are beautiful and the package you sent to Barbara was just as lovely. YOU are a blessing, my friend. Yes Denise is a sweet gal indeed and talented! 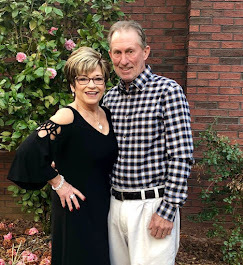 I have enjoyed getting to meet Barbara and now we are friends on FB so that is an extra joy. What beautiful gifts, both given and received! 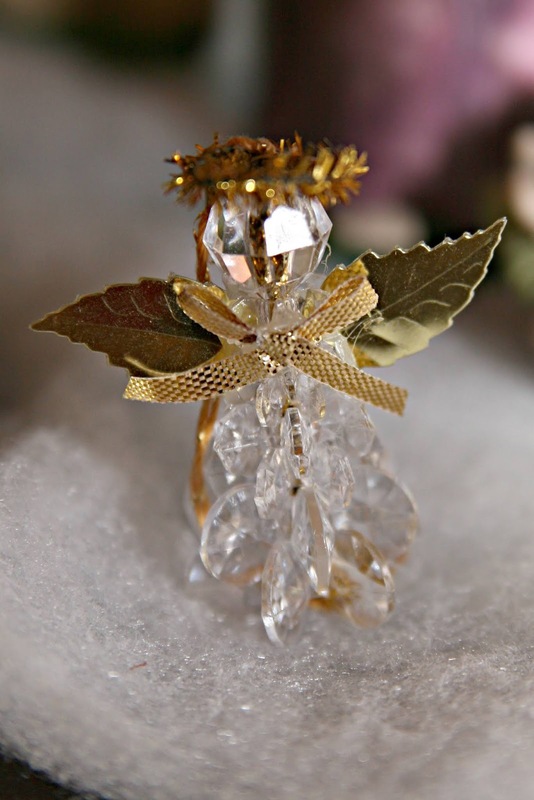 I adore your little snow flake and the blown glass ornament with the poinsettia inside that you sent her is stunning! This certainly was fun...Barbara is the one who gifted me my beautiful ornament and scarf! It's because of our dear Stephanie that we are all friends and it blesses me so! I loved your scarf! See here....best be glad I am not close by...it might go missing! LOL! We could trade out stuff! How fun that would be! LOL! I love seeing what you get in these posts! You got such nice things, loving all of the snowy themed goodies! Thanks Heather. It was so much fun. 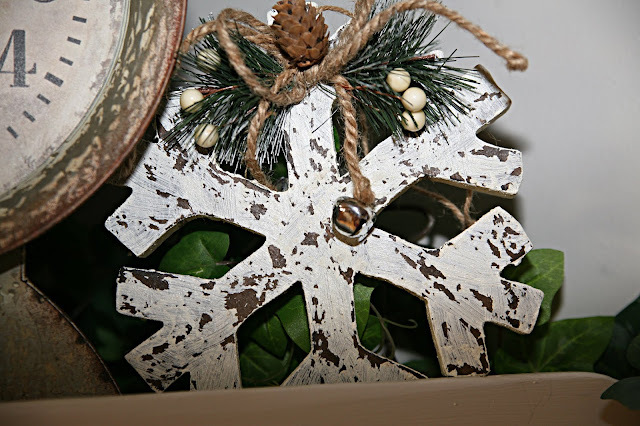 Oh, I love that snowflake ornament....so rustic, which I love the more "rusty" I get...LOL HOPE you and your precious family has a wonderfully blessed CHRIST-mas, my Friend. Love you more! Me too Deb. It is perfect on my top of my corner shelf in the kitchen. What fun Cindy, and I LOVE the snowflake! The towels really are perfect and the angel is sooo pretty! What a wonderful holiday surprise! Enjoy! Thanks Jenna. Merry Christmas to you. Love, love, love this post . I hope you and your family are having a lovely Christmas Season. Thank you Linda . Merry Christmas . 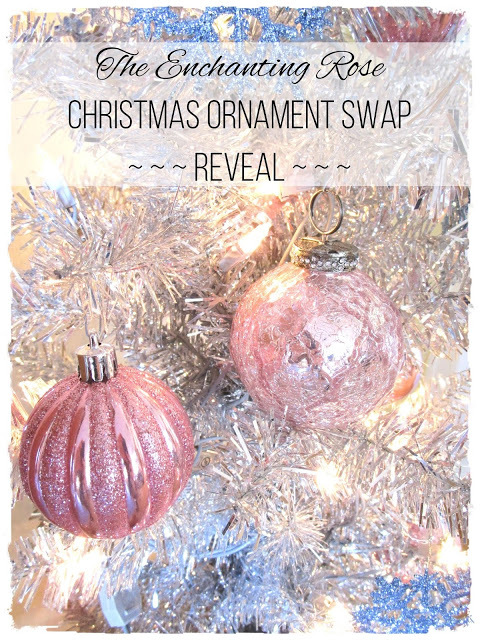 Oh what fun it is to join in on an ornament swap! Wonderful things given and received here. I joined in too and I am glad I did. Yes it is fun. Merry Christmas Ann Marie. Ornament and gift exchanges are so much fun! All the mystery involved and the beautiful surprises that are inside the gorgeous wrapping! I love your gifts and ornaments...so sweet! 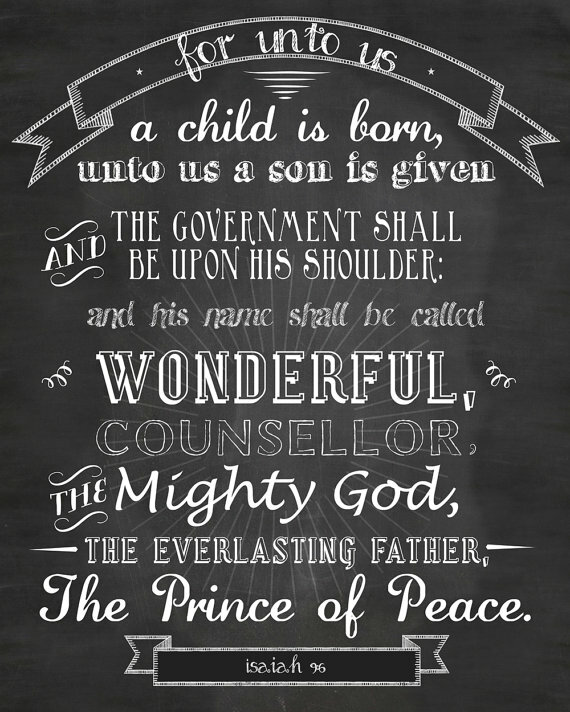 I hope you and your family have a wonderfully blessed Christmas and New Year! Love and hugs! It is so much fun. I enjoy the exchanges/swaps that Stephanie host. I have no clue how she pulls off something this large though. Makes my head hurt thinking about it. LOL! I didn't participate in the exchange this year, so I'm living vicariously through you. The shabby chic snowflake is lovely. I'm also a fan of the cute towels! I'm impressed you were able to part with the beautiful ornament that you sent to Barbara! Thank you Nancy . Merry Christmas . How fun this is...I haven't joined one in awhile...maybe next year. I love everything you got and the things you sent her. Thank you BJ . It was fun . I love everything about this post!! The ornaments are lovely!! The dish towels are so cute! 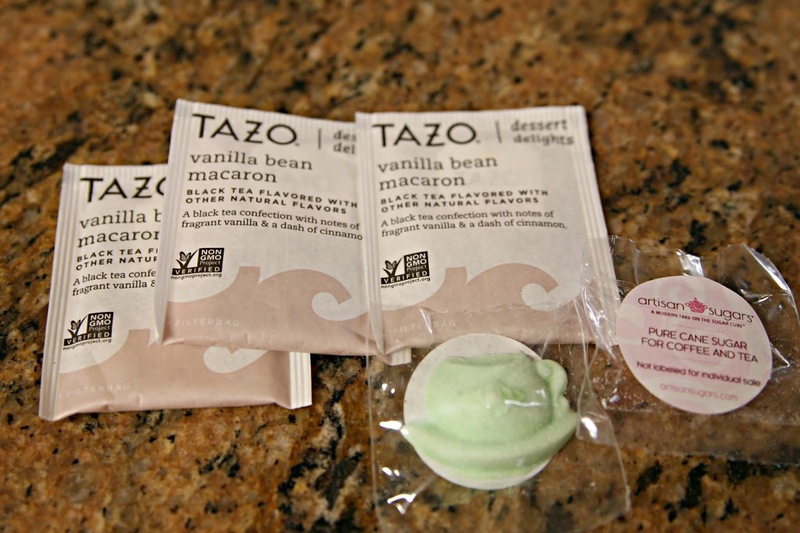 And I will have Joe looking for that flavor of Tazo Tea at Wegman's since Tazo is my favorite brand of Tea!! Merry Christmas to you and your family!!! I love the Tazo teas too Deb . So glad you stopped by . Merry Christmas . What a sweet ornament exchange hosted by the lovely Stephanie! Wishing you and your family the most beautiful and joy-filled Christmas! Thank you Pam and Merry Christmas to you and Butch . I've often thought of participating in Stephanie's tea cup exchange but haven't yet. What a sweet bunch of things you received. Tazo has become one of my favorite teas. Their glazed lemon loaf makes you think you are munching on the real thing! I live the tazo teas Melanie . Stephanie dies an awesome job . Merry Christmas . Oh, how wonderful! I love it all! This is all so much fun, and I agree, I don't know how dear Stephanie pulls it all off like she does! She is an amazing blessing to all of us. So nice to visit with you and see all the goodies! Sending much love and many hugs your way this beautiful Christmas season! Merry Christmas dear Cheryl . It's fun to be included in on your Exchanges or swaps. Everyone is so artistic and clever with their sections. 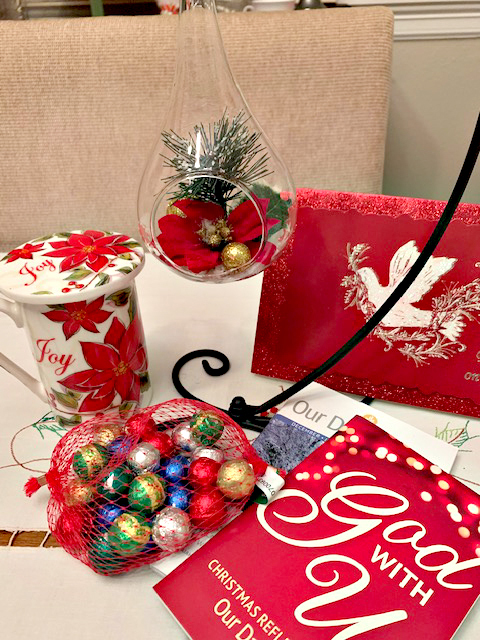 I love a theme and your poinsettias, go perfectly together. Thank you Christine . Merry Christmas . What lovely gifts! 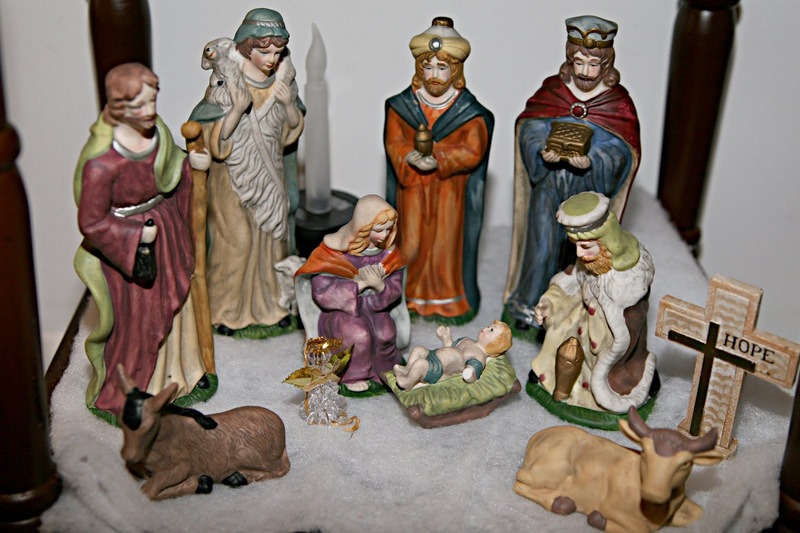 Each one goes perfectly with your Christmas decor and isn’t it special that you gifted her years ago?! Blessings to all of you this Christmas season! We’ve been busy these last couple of weeks preparing for the holidays and keeping our little Jack, which we are LOVING,! Merry Christmas, dear Cindy! Hi Cindy! I love all of your tea goodies you've received! Hope your Christmasing is going well. I want to wish you a merry and blessed one. Merry Christmas to you and your precious family . 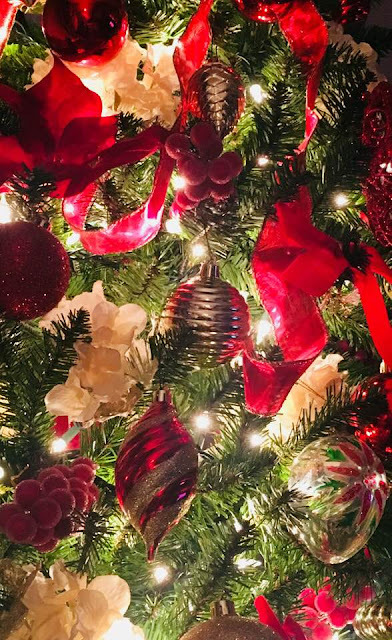 Your Christmas decor looks beautiful. I am so glad you share it. The truck theme is precious. I can see so much love in everything. 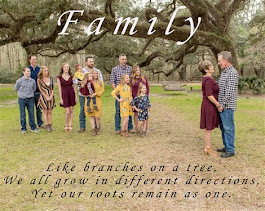 Happy new year to you and your sweet family. Hugs and blessings.